Trump announced the doubling of aluminum and steel tariffs in a tweet Friday, citing bilateral strains. Ties between the countries have been strained as Washington has urged Ankara to release Andrew Brunson, an American pastor being held under house arrest on terrorism charges. The White House dismisses the charges as baseless and has accused Ankara of hostage taking. Turkey wants Brunson to stand trial. U.S. patience with Turkey is seen to have ended, experts said. "Most of the actors in the Washington scene think that carrots just don't work with Turkey, just the stick," said political analyst Atilla Yesilada of Global Source Partners. Friday saw the lira's value falling over 15 percent, bringing the decline to over 40 percent since the beginning of the year. Turkish President Recep Tayyip Erdogan addressed supporters Friday in the provincial city of Bayburt. "We will not lose the economic war," he said. "Turkey will fight economic hitmen just as it fought the coup plotters." The Turkish president alleged Western powers are seeking to oust him from power through the creation of a financial crisis, after failing to so during a 2016 coup attempt. "Some countries have engaged in behavior that protects coup plotters and knows no laws or justice," he said. "Relations with countries who behave like this have reached a point beyond salvaging." Erdogan's claim of a Western political plot against him sparked alarm in investors and prompted an acceleration in the currency sell-off. 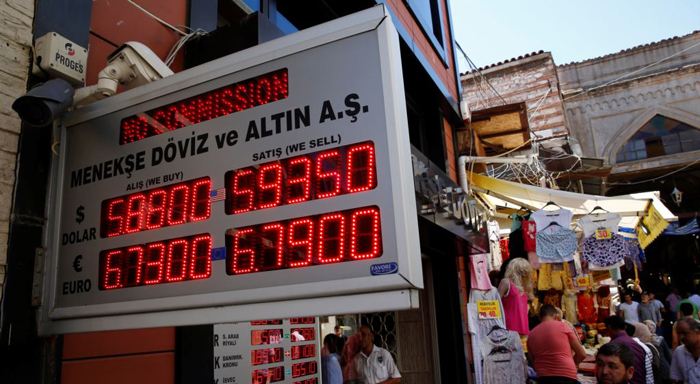 Ankara is under pressure to adopt orthodox steps to protect the lira by aggressively increasing interest rates to rein in double-digit inflation, a move Erdogan has publicly opposed. Adding to investors' concerns, Erdogan pledged a continuation of his debt-fueled construction policy to boost the economy, which is blamed for Turkey's rampant inflation and has added to currency weakness. The Turkish president on Friday dismissed such concerns and called for people to defend the currency. "Those who have dollars, euros or gold under their pillows should go and exchange them into [Turkish] lira. This is a national struggle. This will be my nation's response to those who have declared an economic war," Erdogan said during the rally. "I don't think foreign banks will be willing to lend to Turkish banks. There are so many rumors percolating that large companies are going bankrupt," said analyst Yesilada. "I am afraid there will be a bank run in Turkey, people rushing to withdraw their deposits." But the souring in U.S.-Turkey relations could give new strength to Russia-Turkey ties, already a source of concern among Turkey's Western allies. "There are historical and geopolitical reasons for limits with relations with Moscow, limits I think we've reached," said international relations expert Soli Ozel of Istanbul's Kadir Has University. "But if the United States can't handle relations with Turkey … then a further deepening of relations with Moscow is an option. It may be not the best, but it is an option."